Silica gel chromatography packing is made of monodisperse porous silica microspheres with highly uniform particle size, perfect spherical morphology and optimized pore structure. Our silica gel chromatography media meets the requirements of high performance liquid chromatography (HPLC) analysis in the laboratory and preparative separations in industry scale. 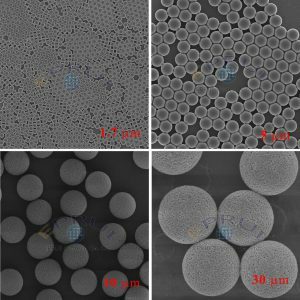 The monodisperse spherical porous silica gel has distinct advantages such as highly uniform particle size, perfect spherical morphology, outstanding mechanical strength, easy column packing, high column efficiency, good resolution, low back pressure and exceptional batch to batch reproducibility. 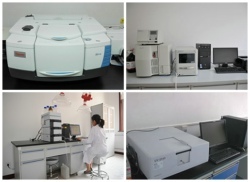 It has already been widely used in analysis and separation of organic compounds, peptides, nucleic acids, antibiotics and low molecular weight pharmaceuticals. 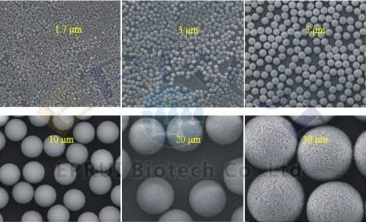 EPRUI Biotech Co. Ltd. supplies highly uniform, ultra pure porous silica microspheres with various particle size ranging from 1.7um to 40um.EPRUI develops new surface bonding and end capping technology to provide non polar packing media such as C18, C8 and C4. others (cod liver oil, bortezomib, flurbiprofen axetil), etc.